/ Are Havanese Toy Dogs? What is the Definition? Are Havanese toy dogs. This is a very common questions among dog owners, especially those that are potential future owners of Havanese. I am not sure whether “toy dogs” has a very official definition. But in order to answer this question, I am going to definite this term as clearly as I can and I am also going to discuss whether Havanese belong to that group. From the cute appearance of Havanese and your interpretation of the term “toy dogs”, you may think that Havanese are definitely toy dogs, but there is actually more to that. Let’s go explore this interesting topic right away. A toy dog is dog that is small enough to sit on your lap. The word “toy” represents the cute part of a small dog. In fact, the small size of a dog is the most important criteria for it to be considered as a toy dog. Although all toy dogs are small, not all small dogs can be considered as toy dogs. Beside the size of a dog breed, there are other characteristics that make them belong to the group of toy dogs. Let’s take a look at some of these other criteria now. One very important characteristics of a toy dog is its friendliness. “Toy” is supposed to be safe and fun and it is not suppose to harm you and other people. It make a lot sense to make “friendliness” as a criteria for being a toy dog. When it comes to friendliness of a dog, it usually includes being friendly to children and to other pets. In fact, for those of you who have other pets and children at home, choosing a dog with good temperament is very important. You simply don’t want them to get hurt or feel uncomfortable. Toy dogs also should be dogs that are a good companion. That means that they don’t require you to use a crazy amount of effort to take care of them. Keep it mind that this is only relatively speaking by comparing the toy dogs with other dog breeds. For example, these toy dogs generally don’t require a huge amount of exercise and they don’t run super fast so you have a hard time taking care of them when you play with them. Generally speaking, the exercise they require is the amount that can make you fit and not exhausted. For example, they will require the owners to walk roughly 30 minutes to 1 hour with them. Some people would say that a toy dog should be also a good watchdog. To me, this criteria is not as required as other criteria, although it makes perfect sense that a good watchdog would make your life just a little safer and better. Up to this point, you should have a pretty good picture of what toy dogs should look and behave like. But you may be wondering whether this is a list of toy dog breeds that everyone agree on. The fact is the the group “toy dog” is a group of breeds that different dog clubs from around the world have a slightly different definition. I would say that over 90% of the list is pretty much the same. I will go a little deeper on this topic later in this piece of writing. I just want you to know that “toy dogs” is really not something that has a very official and perfectly-defined definition. Yes, Havanese are generally considered as toy dogs. 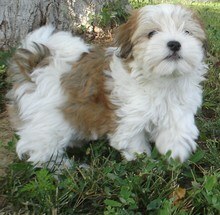 Let’s look at how Havanese match with the list of criteria we have listed. I am pretty sure that most Havanese can fit on their owners’ laps. They are definitely considered small dogs which is a requirement for being a toy dog. It is pretty well-known that Havanese can get along with children and other pets really well. There are always exceptions but, generally speaking, they are the super friendly and cheerful breed that many people love. Although cheerfulness doesn’t officially count when it comes to being categories as dog breeds, I think it does make Havanese more of a toy dog. Havanese are great companions that generally don’t require the owners to put a crazy amount of effort to take care of them. Don’t get me wrong. I am not saying that they don’t need to have exercise. They do and in fact they are considered to be above-average high energy dogs among small dogs. You should be prepared to walk your Havanese around 45 minutes a day which may sound like a lot of those of you who are used to do exercise, but actually very reasonable if you look at it rationally. The 45 minute daily walk is going to keep you and your Havanese in relatively good shape. Havanese are intelligent enough to be trained as watchdogs. It is worth mentioning that there is difference between watchdogs and guard dogs. There is really very few weaknesses in the character of Havanese when it comes to being a good companion. Some people may feel offensed by the work “toy dogs”. For many people, their Havanese are their children and it may be weird to them when you refer their children as “toy dogs”. Don’t be offensed by that as this is just a term to categorize a very nice group of small and friendly dogs. In fact, you should be proud of having a toy dog with you. In conclusion, toy dogs usually mean dogs that are small, friendly and relatively easy to take care of. Havanese have all these good characters and they are definitely toy dogs.